For use at Indy in 1963, Ford prepared a special version of the recently introduced 260 CID engine. In stock form this engine produced 157 BHP. After an extensive series of modifications, the final engine displaced 255 CI and produced 376 BHP with good durability. Many parts were replaced with aluminum or magnesium to trim the weight down to 350 lbs. While impressive for a hotrodded 260, successful competition at Indy in 1964 was simply going to require more horsepower. And to do this, the breathing of the engine had to be improved. 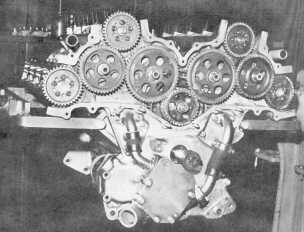 For 1964 a dual overhead cam version of the engine was produced. The block was cast of aluminum alloy, using patterns modified from the production 289. Cast iron cylinder sleeves were a shrink fit in the block, are were sealed at the heads with copper laminated steel O-rings. In order to clear the two banks of camshafts in the heads, the 10 attaching studs were moved in closer to the cylinder centerline. An additional 8 studs protuding from the heads maintained the clamping force needed to seal the combustion chambers. 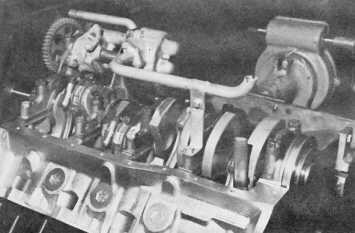 The space occupied by the camshaft in the normal production engine was replaced with an oil tube. This acted as a gutter and collected oil as it drained from above to keep it off the reciprocating assembly. The bottom end was beefed up considerably. The special forged steel crankshaft was held by 4-bolt bearing caps on numbers 1 through 4. Main and rod bearing journals are the same size as the 289, as is the engine's stroke - 2.87". The rod journals are crossdrilled for better oiling at high engine speeds. The rods are from the 289 HiPo, having been modified for floating pistons pins. The pins are 289 HiPo pieces. The oil pan is cast magnesium and is a structural part of the engine as is common in Indy and Formula car design. Ears cast intregrally with the pan provide the engine mounting points in the chassis. The cam-ground forged aluminum pistons have a pent-roof dome to closely fit the combustion chambers. Compression is 12.5:1. 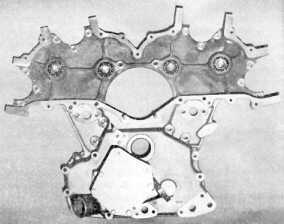 The cylinder heads used 4 valves per cylinder with a central spark plug location. The plugs are canted toward the 1.64" diameter intake valves. Exhaust valves are 1.36" diameter. 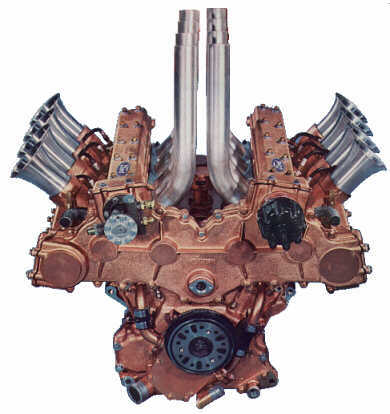 The camshafts run in bearing bores in the cylinder heads, directly over their valve banks. Valve clearance is adjusted by the selective fitting of the followers. Intake ports are between the cams, with exhaust out the top of the heads between the vee. This was done to do away with the nightmare of exhaust tubing normally required. Hilborn injection is used having been selected for its light weight and simple low-pressure design. The Indy engine uses a dry-sump oiling system. But unlike most current practice, the scavenge and pressure pumps were mounted withint the crankcase. The pump assembly is mounted to ears on the #1 and #2 main bearing caps, and gear driven off the crankshaft. The scavenge section is designed to be larger than needed to help ensure a partial vacuum exists in the crankcase for improved ring sealing. Camshaft and accessory drive forms quite an impressive assemblage of gears. 14 in all, including a few that drive the oil pumps and water pump. Ball bearings in the two-piece front cover support the jackshafts for the gears. Very accurate machining of these parts results in only .010" backlash between the crankshaft and any camshaft. A vernier arrangement of the gear mounting holes allows the camshaft timing to be set to within 1 degree of design specification.